Darien senior skiiers pose with photos of themselves from this past season. L to R: Taylor Hart, Katharine Graham, Chris von Stuelpnagel, Graham Skeats, Gray Kline. At the Connecticut Interscholastic Ski League (CISL) championship race at Mount Southington, the Darien High School girls ski team finished sixth in the Class L division and seventh overall. The Darien High School Ski Team was moved into the Large School division for the first time this year. "I am proud of the girls' team for competing in the state championships for 10 years in a row," Coach Zeyer said. The award ceremony after the CISL championship race recognized Katharine Graham (Co-captain) first team All-State in the CISL made up of about 700 girls and boys from 28 high schools. 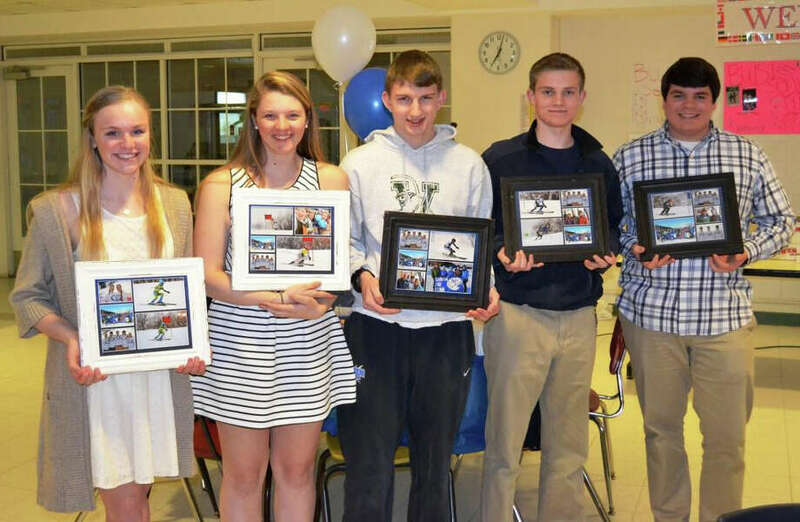 The Darien High School Ski Awards Banquet celebrated another challenging and successful season. The boy's Most Valuable Player was freshman AJ Scolaro. Senior Graham was named the Girl's Most Valuable Player. The girls' times in the Connecticut State Championships were Graham (Co-captain) 52.40, Maggie Skeats 52.78, Taylor Hart (Co-captain) 53.33, Carly Schoudel 55.86, Christina Molkenthin 62.43, Maggie Reilly 63.05, Kylie Morgan 66.11, Isabel Sutherland 66.97, Maddie Corman 67.30, and Victoria Klarer 68.28. Departing seniors for the Girls' team are Graham (Co-captain) and Taylor Hart (Co-captain). Graham Skeats (Co-captain), Chris von Stuelpnagle (Co-captain) and Gray Kline are the seniors graduating from the Boys' team. "Katharine certainly deserves the MVP award as she led the team all season again this year. It was great for AJ to also receive the award as he was consistently supportive of the team," Coach Brian Zeyer said. Assistant Coach Marc Power added, "The team members provided great support for each other all season long and I couldn't be more proud of their effort during the season and the Championship races."